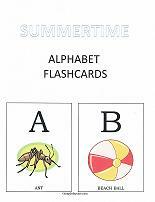 The printable flashcards below involve a summertime theme. 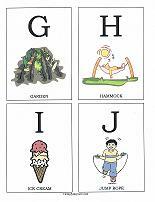 There is a picture for every letter of the alphabet. 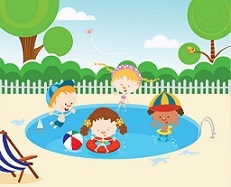 Each picture is something that kids see or do in the summertime. Keep the lessons short. Five to seven minutes at a time, once or twice a day is enough. Realize also that all children will have days when they are not in the mood. Never press a child to learn if they are having a rough day. Save the lessons for when your child is eager to learn. 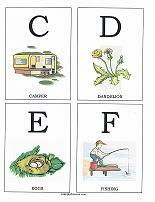 Start small, with perhaps five cards. 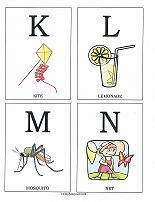 Say the name of the letter and use your index finger to trace around the letter. 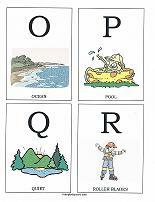 Have the child repeat the name of the letter after you. Introduce new cards only after the previous ones have been learned. 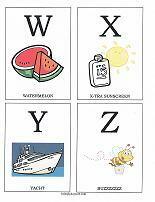 The summer-time cards can be used one-on-one with a child and work equally well in small groups.